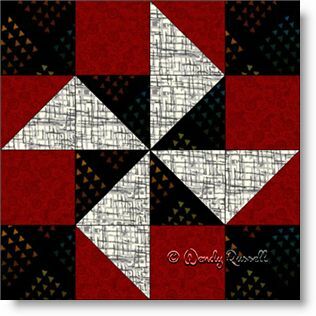 The Pall Mall quilt block is a four patch that is a good choice for the beginner quilter. It contains only simple shapes -- squares and half square triangles. However, don't let the fact that this is a simple block to make, as it can be quite effective when used in your quilt. The sample quilts illustrated show two different styles of settings -- the side by side layout (with sashing) as well as an on point style. By adding extra blank blocks you can extend the size of your quilt and show off your quilting skills as well.